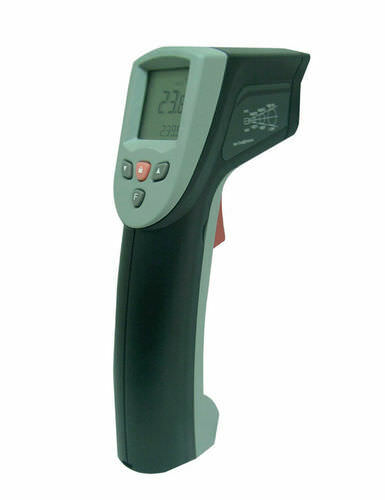 The CALEX ST640 Series Low Cost Handheld Infrared Thermometers are a perfect cost-effective choice among various handheld infrared thermometers with laser sighting and large LCD displays. They can measure temperatures from -32 to 535 °C, with the accuracy of 0.1 °C. Their FOV is 12:1, offering minimization of errors, while maintaining a small diameter measuring area. Emission is constant, with the value of 0.95, therefore, these thermometers can be used for most organic materials and non-shiny (painted, corroded or anodized) metals. The emission of the ST642 can be adjusted, on values from 0.1 to 1.0, automatically, via thermocouple input and a eSmart feature. Each of these models offers audio and visual indicators in form of color changing on display, notifying the user of excess temperature, either in °C or °F, depending on the user's choice. They are powered by a standard PP3, 9 V battery.